I am having such great fun making my doll millinery. Growing up we wore hats to church every Sunday and had lots and lots in every color with beautiful flowers and accents. I guess my love of hats has carried over into my doll world. The hats are made using traditional millinery techniques of “Flat Pattern” and “Blocking”. Flat Pattern uses buckram and milliner’s wire to shape the hat which is then covered with fashion fabric and accents. 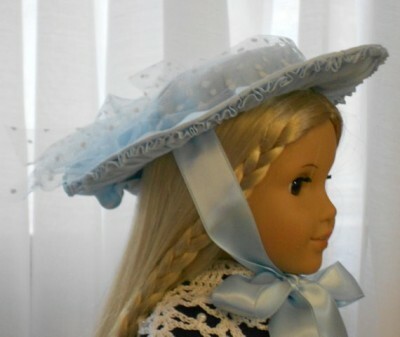 Baby Blue was inspired by an early 1800’s French Doll Hat. Blocking, my newest endeavor, is shaping wool felt or other materials over a form, or “Block”. The fabric is stiffened to hold its shape. 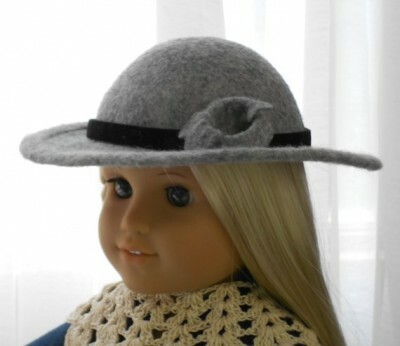 The Gray School Girl” hat is blocked from a gray wool felt. It has a wired brim to help keep its shape. Most of my hats have a head circumference of 12″ but I can create any size.